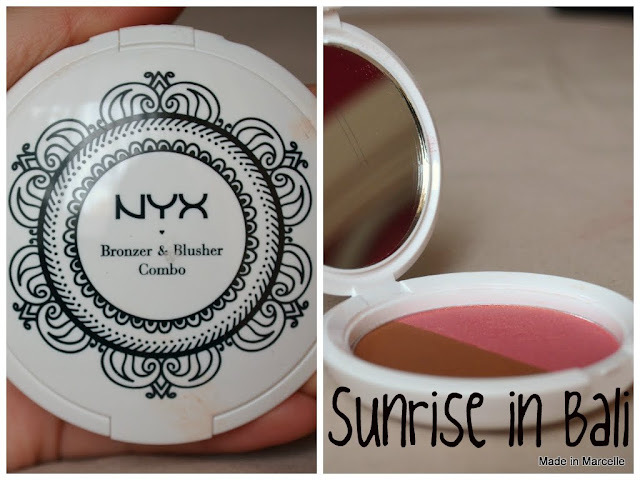 I recently bought this NYX Bronzer & Blusher combo in Sunrise in Bali from Cherry Culture. I haven’t really seen or heard much about this product so this was a bit of a spontaneous buy. The 2-1 pact seemed like a good idea and since I will be blended both bronzer and blush together, this would work well right? The description from their website. Get the perfect sun-kissed glow with complementing color combinations from our Bronzer/Blusher Combo. Each blush and bronzer pairing features flattering and natural-looking hues. Achieve the impeccable Springtime and Summertime glimmer that will radiate a goddess glow. The different shades are all named after exotic places and at first glance they do look really similar. They all contain a bronzer half and a blusher half. The blushes are all quite shimmery though as suggested by their information. But on their website they give quite a good description on the type of bronzer and blush each one contains. The white plastic packaging feels quite sturdy.As nice as the white looks, it gets dirty way too quickly. (As you can see in the picture above) But it is a good compact size, great for travelling. Especially since you are carrying 2 products in 1. Usually combo products do not give as good a pay off as they do individually but I was quite impressed with this combo. The swatches were surprisingly pigmented and the blush colour is so gorgeous. With the close up you can see the find gold shimmer in the blush which makes the pink blush seem more corally than it actually is. The sheen it gives when swiped reminds me a lot of baked blushes. This was only one swipe from the combo. Crazy, I know. It reminded me of an eyeshadow to be honest. But here you can see the separation in the base colour and the gold shimmer as the pink does peek through more. The bronzer took more effort to get a strong colour but I prefer it this way. It makes it a lot easier to control the amount of product being deposited on the face and makes contouring a lot easier. There is a tiny amount of shimmer in it but it is very faint on the skin. You can see it though so it is not completely matte nor would I classify it as shimmery. It is a little more orange than I would like because my skin is more neutral toned but in summer I (barely) tan so I will have to try it and let you know how it goes. As you can see I have yet to try these on my face but during my test blending these looked gorgeous together. The downside is that they do seem more suitable for warmer months so I may have to wait a while before getting a lot of use out of these.